I don't have much else to say about this. Truly. It's easy. Much easier than it looks with all those steps you'll see below. It's waaayyy more delicious than the Key Lime Pie I made about a year ago. Each of the three layers has its own wonderful texture and flavor and they combine into a perfectly textured, perfectly tart and complex treat. I was given the advice several years ago that cheesecakes should only ever be mixed by hand. That it makes for a more dense, less airy filling. I followed that advice exactly once. Too many sore muscles and too many blisters later, I realized that I could use my Kitchenaid for a shorter (and less strenuous) process, with just as delicious of a product. IMO. I just don't beat the crap out of it. I beat it until everything is combined and then STOP. This recipe calls for the filling to be put together in a food processor. Which, obviously, is even faster than the Kitchenaid, but I didn't really like that method. I felt like I had less control over what was going on in the bowl, and then when I realized there was still some liquid in the bottom, I couldn't really stir it all together like I can in my mixer bowl. So, that's the only thing I would change, if I were to change anything about this recipe. Carefully spoon sour cream mixture over hot cheesecake; smooth top. Bake until topping sets, about 10 minutes. Cool 10 minutes. Run knife around sides of pan to loosen. Cool cheesecake completely. Cover and refrigerate overnight. Do ahead Can be made 2 days ahead. Keep refrigerated. Release pan sides from cheesecake; transfer to platter. 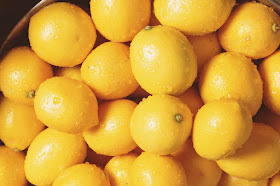 Garnish with lime slices and serve. Oh, AND, I read some of the comments on the recipe and, based on those, decided not to cook it in a water bath. Instead, I put a pan of water in the oven beneath the cheesecake. It's the first time I've tried that and, lo and behold--no cracking! Miraculous. Next up: Chocolate-Gingerbread Cookies. 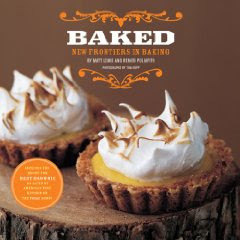 The BAKED boys are featured in the December issue of Food & Wine Magazine. As possibly their biggest fan this side of the Mississippi, I am compelled to try every recipe they publish.